For exactly one minute on Friday night, it looked as if the Buffalo Sabres were ready to show their fans that their fortunes were about to take a turn for the better. They had returned from a good-sized Western road trip on Tuesday, thus earning a couple of days between games – a reasonable opportunity to recharge the batteries. Friday’s opponent, the Vancouver Canucks, had played Thursday night in Boston. The Canucks had given up five straight goals at one point in a 6-3 loss. So when Justin Bailey scored a minute into Friday’s contest, the Sabres couldn’t have asked for a better start. Get out in front of the more tired visitors, then take a two-goal lead, and away you go: five points in the standings in three games. Except – Buffalo’s good feelings ended with Bailey’s goal, as they went on to drop a 4-2 decision in the KeyBank Center. 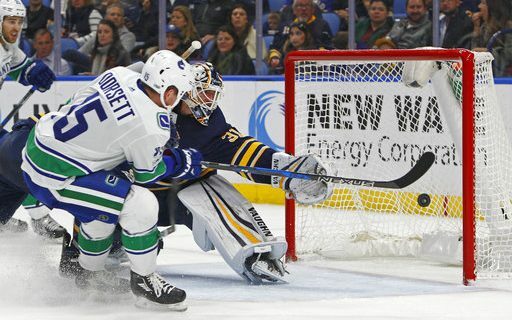 For the next 39 minutes of play, the Canucks barely let the Sabres touch the puck. The shots after two periods were 37-13 for Vancouver, and the Buffalo defense blocked a few more to prevent the total from being even worse. Those two periods prompted a couple of old hockey jokes to come to mind. As the Vancouver shot total built up, the line about only resurfacing half of the ice demanded to be said. On one Canuck power play, Vancouver only let the Sabres even touch the puck a few times. The other joke came when the Sabres gave up yet another short-handed goal, a big one that tied the score at 2-2 in the second period. It came after Jack Eichel had made a highlight-reel play to put Buffalo ahead late in the first period. That’s six short-handed goals against already this season. The wisecrack, of course, is to decline the penalty. Vancouver scored the eventual winning goal (Daniel Sedin) on a play that was reviewed for a figurative eternity, only to be ruled a good goal. The replay officials were about the only ones on the continent who thought the Canucks were not offside on the play. The Sabres certainly didn’t deserve to be anywhere near striking distance after 40 minutes, but were only down by 3-2. One burst of individual brilliance could have led to an undeserved point or two. But Vancouver played a cautious and smart third period, and Buffalo never could tie the game up. We’re not even a tenth into the long, long NHL schedule, so it’s obviously not time to start think of drastic personnel moves. Still, the Sabres are at 1-5-2, thus burying any hopes of the sort of the fast start that could get people – players and fans alive – to get excited about the remaining 74 games and its playoff possibilities. The Sabres are on to Boston on Saturday night. They will host Detroit on Tuesday.